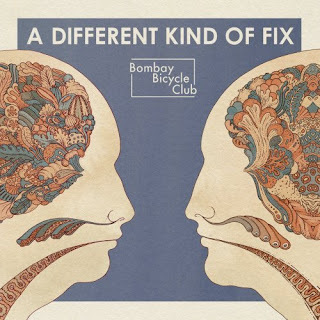 Discussions Magazine Music Blog: BOMBAY BICYCLE CLUB/A Different Kind Of Fix: Available January 17th, 2012! BOMBAY BICYCLE CLUB/A Different Kind Of Fix: Available January 17th, 2012! 2012 release, the third album from the British Alt-Rock/Pop band. Recorded in Hamburg, London and Atlanta, A Different Kind Of Fix sees the guitars firmly plugged back in for album number three, but added to the mix are synths, sampled loops, layered vocals from all four band members and washes of reverb throughout. Production-wise, the album reunites BBC with Jim Abbiss--who produced their debut--and also introduces them to Ben Allen (noted for his work with Animal Collective) whilst lead singer, Jack Steadman co-produces throughout. Includes first single, "Shuffle", "How Can You Swallow So Much Sleep" and "Take The Right One".